you guys, it’s finally here. after an amazing eight years photographing hundreds of weddings and families as pink sugar photography, it’s time i step out from behind the brand and just be me. i’m so excited to introduce my new branding, my new website, and myself. (hi! i’m andrea.) same person, same crazy love of photography, but now you can find everything i love all in one place — my portfolio, tons of new content, my blog for client sessions and my personal blog featuring daily-ish photographs of my little family, our adventures, and our favourite things. grab a drink, get comfortable and take a peek around; there’s so much to see! giant thanks to nikki and shannon of gimme that it for pushing me out of my comfort zone, making my vision a reality (and even better than i ever could have imagined it), and putting up with my type a/nit picky/indecisive/need to be in control at all times tendencies. you made the process so fun and i couldn’t be happier with the final result. $500 on any full day 2015 wedding booking. thank you so much to all of you who have supported me, followed along with my work and family, and trusted me with your beautiful weddings and amazing families over the past eight years; i am so excited to share this new chapter with you. Erin - I love your work & have been following you as Pink Sugar – I’m excited to see this next chapter. Congrats! Mallory - Andrea, congratulations! I’ve been a long follower of Lila Was Here then Pink Sugarland and how Hankiland. Can’t wait to see what is in store for your sweet family. My husband’s work has taken us to Germany for 3 years. With that comes many, many challenges and heartbreaks – being away from our families, me leaving my job, a pilot husband who’s schedule keeps him away from home more than we’d like – but as a family rule we like to focus on the positive. So instead of dwelling on the difficulties of living in a completely foreign culture, we revel in it. We travel as much as we possibly can, and love every minute of it (which, with a 2 year old and pregnant mama in tow, isn’t always as easy as it seems). We enjoy experiencing the world and different cultures together, exposing our son to the world, and becoming true citizens of the world. I would love to capture this time in our lives – the chaotic traveling years. Who knows if we’ll always cast our net so wide when it comes to world travel, but right now, while it is so easy, we can. My son’s favorite place in the world is the Tour Eiffel. His favorite pretend games to play are riding in buses, metros, and street cars. He loves croissants in all shapes in sizes. And to me, the culture he is experiencing make everything else worth it. MARI CARMEN - Beautifull Andrea!! Adrea Hamdan - Congratulations! I too have been following you for years. I love that you see the joy and photograph the simplest things in life (a bath in the kitchen sink), b/c us other Mom’s do it too – we just don’t always document it! JULIE - Congrats Andrea. Reese just turned 8 – hard to believe it was that long ago when you started capturing our family story. We’ve been wanting to touch base to set something up for our “every two year family photo” – so let me know what your spring/summer is looking like. Love reading this, thanks for sharing. Wendi Cowne - Special thing about my family that I would like documented…. The little touches that we give each other throughout the day to show our affection. As I walk past my husband while he’s reading in his chair, I run my fingers through his hair. As my husband leaves for work, he picks up our giant 8-year-old for a huge hug and her hands instinctively make their way to his ear lobes. This earlobe thing is something that she’s done since she was tiny. She does it to me, too. I watch her sleep sometimes, as most mothers do. We have dance parties in our living room after a particularly successful dinner. While I’m preparing dinner, my husband sits at the bar and chats with me, whilst refilling my wine glass as needed. We hold hands often and my closed fist fits inside of his giant hands entirely. Lindsay Ross - First off, congrats on your new photo journey! The site/blog look fantastic (no surprise there) I look forward to continuing to be inspired by your incredible view on the world. Robyn - I’ve followed your work since Lila Was Here and I think you have such a gift at capturing the beauty of the everyday – it really has inspired my own photographs and even my own motherhood. I’ve just moved to London, UK with my husband and two year old son and we would love to have you here to capture our new life! Amanda - I’d love to capture the way my boys interact. The way the baby tracks his big brother’s every move. How they make each other smile. The way they “share”. How they cheer each other up. They share at least one moment every day that makes my mommy heart burst. Sarah - crazy fun and beautiful – love the new site! Amber Bourret - The new look is fantastic!! I’ve followed you for a ridiculously long time, since before I started my journey as a photographer. Your a huge source of inspiration to me, and your work is one of the main reasons I love lifestyle photography. Shara Cochrane - Andrea!! I am LOVING the new rebrand. Well done lady. Good for you for coming out of your comfort zone and doing the extraordinary. But this doesn’t surprise me. Everything you do is extraordinary. EVERYTHING. I have loved following along with all you do, Lila Was Here, Pinksugarland, Instagram and now Hankiland. I can’t wait to see all the new goodness that is going to come out of it. You are beyond an inspiration. That is quite the question, what isn’t special about my little family. My husband. He for sure is special. He is handsome and hilarious. He really is the perfect man to spend a life with. Our little family will be expanding this October, and I would love to have some new family photos. Lesley - i absolutely love your new site andrea! congrats! it’s gorgeous. Kyla - Congrats on a great launch! Brandy Jane Mabel - I love the new look! How exciting! I would love to win a session! I would love some real and simple moments with my family captured! I am not in enough pictures with my kids and it has been something I am trying to fix! rychelle - my daughter’s adoption finalization is coming up, and i would LOVE to have that day documented by a professional photographer. but, really any day documented is a blessing! Lori Erickson - I love how my kids light up when their dad makes us laugh, how animated my sons are explaining science or animation, how our girl feels the need to make art and dish out squeezey hugs all day long…& I am there just taking it in, hoping I can remember it all. Amber - Wow! Such a fabulous website Andrea! I’ve been a long time follower of yours since you took all the gorgeous photos for my best friend’s wedding… yep we were those Mc’Donalds crew! Krista - Congratulations on the re-vamp! Looks great! My husband and I are new parents. We had our first child in the fall and we would love to have you capture this time of the three of us while our boy is still little. It would also be a treat to be included in the photos because I tend to take the photos and am not fast enough for the timer haha I’m usually the blur in the photos 🙂 fingers crossed that we’ll meet! Happy launch day! Aminah Syed - Holy! Nicely done Andrea. This site is awesome. Vanessa - Love the new brand. Absolutely fantastic. Congratulations! joc - well this is a no brainer… like yourself- you’re always on the other side of that lens. our third is 3 months and of course my body isn’t near where I would like it to be yet-but I need to be in front of that lens for my kidlets. so they can see all 5 us of in images. laughing and cuddling and just being. just living. Jessica St. Cyr - I love your rebranding! Everything is so beautiful! Congrats!! Heather Rattai - Any type of photo that I am actually in would be wonderful. But I think either making breakfast (as it is one of my favourite times with our family) or on the golf course or driving range would be fun too. Melanie Pastuck - My family has gone through some restructuring over the past 4 years. It hasn’t been an easy road for my 3 kids and me – we have lots of tricky days but there are moments that I wish that instead of being the photographer, I was being photographed. With them. Our cuddles. Our laughs. Our moments. I just want some really happy and lovely moments for them to look back on when they are older. Moments that remind them that they (we) survived and thrived. Shelley - Lovely new site! I’ve been a long admirer. Michelle - The baby has bright warm soulful eyes and is always ready with a smile. His thighs have rolls you want to smear with butter (figuratively!!) and he has a pouty bottom lip that melts your heart. He’s a little stuck on Mama and that’s perfectly fine with her. The toddler charms and entertains just about every one she meets. Outgoing, engaging, talkative and *expressive*, she makes most people laugh with her big personality. She’s also comfortable and pretty cooperative in front of the camera, and for a brief time as an infant probably thought that little black box with the circular nose was indeed her mother’s face. Mama is the documentarian. She photographs her little family almost daily while trying to desperately find the balance between living in the moment and recording it for posterity because those moments that make you catch your breath a little bit are so fleeting. She also has the title of Head Goofball and often enlists her loved ones (sometimes with bribery) in silly ventures because she holds firm to the belief that if we can laugh just a little bit every day, then everything will be just fine. Papa. He’s the quiet one but no less a clown. He’s the backbone to this family and keeps us grounded, safe and loved beyond measure. He is Mama’s biggest cheerleader, the toddler’s hero, and the baby’s wingman. We adore him. I would for you to capture those tiny sparks that flicker among us. The love, the knowing glances, the understanding, the chemistry — that “thing” that makes us who we are. Christin - I’d LOVE to be documented with my children. They always see me behind the camera and now that I’m working full time I don’t get to spend as much time with them. Bri - What a beautiful, beautiful site! Sarah M - Congratulations on your brilliant launch!! Michelle p - *wife (me) has loved your photography since discovering it with Lila is here. You inspired me to buy an slr and attempt to take magical pictures of my kids. *husband is cheap and will not give me the green light to make the investment in a session. *son loves lego, bike riding, snuggles with mom and rootbeer floats. *daughter loves princesses, baking, painting her nails and her cats. Christie Spencer - Congratulations on the new launch! I have been reading your blogs and following your journey forever, and couldn’t be more excited to watch this next chapter unfold for you. Urska - I LOVE your new site. I have been following you when there was only Lila and you have grown so much personally and professionally since then. It is almost like every child brings on new changes. Ashley Johnson - Something about my family that I would like to be documented are the fantabulous personalities of my two nieces and two nephews. They truly make my world a better place, and having the honour to watch them grow is such a privilege. Loving everything you are doing with the new launch! You are such an inspiration! I would loving nothing more than for you to capture the absolute joy that our little guy -Hunter has brought to our family. It’s completely indescribable. He is such a free spirit and as new(ish) parents we are totally captivated by him. Anne - My husband and I don’t have any children at this time, so it’s only him and I but we are trying to start a family. If we won, it would be amazing to have a lifestyle maternity session! As a side note, I’ve been following you for years (back when you only has Lila) and I just want to say that you a simply amazing. A person I truly look up to when I hopefully become a mother! Suzanne - Oh how it seems I am a needle in a haystack of entries.. 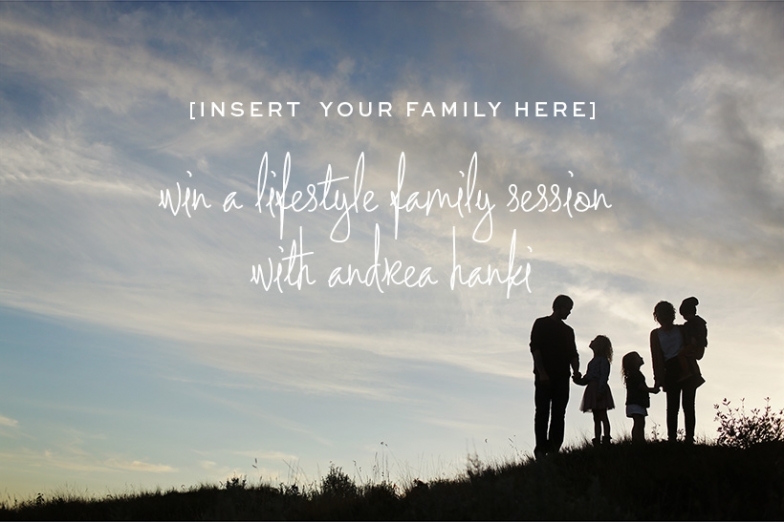 But, I would sure love to have my little Fam Jam captured by you! My two boys, my husband and I would be thrilled! I am the photo taker in my family and I would love to have a chance to actually be in some photos with my boys where I’m actually in focus and my head is not chopped off or my eyes are closed! Life is going way too quickly and I often think how one day I will be looking back on these years as the absolute best years. Lisa - I have been so fortunate to have you capture the special moments of our family throughout the last 6 years. I adore all the pictures that you have taken of us as our family has grown and I know they will be our special treasures throughout our lifetime.